Canadian artists Jonathan Hirsh and Jon Rierawill exhibit their independent video installation project ‘In the Moment’ at Scotiabank’s Nuit Blanche at the ROUND venue located in the Kensington market at 152a Augusta Avenue on October 3, 2015 from 7 a.m. to 7 p.m. Scotiabank Nuit Blanche, a signature event produced by the City Of Toronto is an annualexposé of contemporary arts created by hundreds of artists, who through their individuality and energy take over the City of Toronto. With the growth of media reaching new levels due to technological advances, artists are finding unique ways to reach and engage audiences. 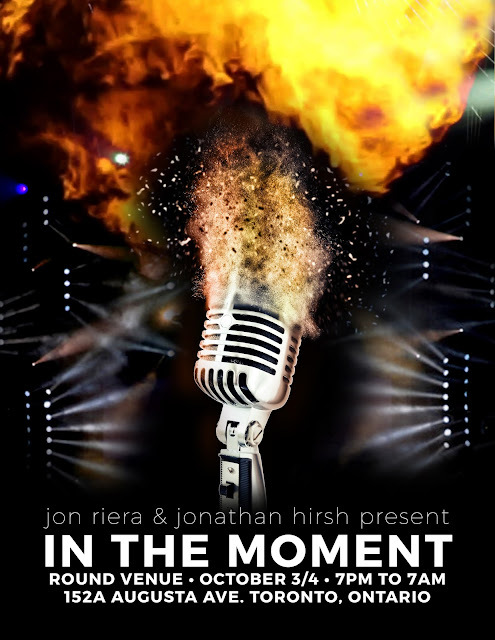 Therefore, Jonathan and Jon, created In The Moment which is an immersive, interactive, sensory experience that allows viewers to relive concerts by Canadian and international artists. Some of the exciting visuals that will be immersed in this installation will include great music artists such as: Jazz Cartier, Torro Torro and A Tribe called Red. Jazz Cartier is a Canadian rapper who launched his debut album Maraunding in Paradise in April 2015. He was also the nominee for the 2015 Polaris Music Prize. A Tribe called Red is a Canadian electronic music band that beautifully blends instrumental hip-hop, reggae, moombahton, and dubstep- influenced dance music different elements of First Nations like chanting, drumming and vocals. Torro Torro is the brainchild of Mike Gonek and Evan Norton who, influenced by the cultural diversity of Toronto crafted unique electronic sounds and soon became a recognized leader in the dance music genre. Jonathan is the Director of Productions for Floating Island Entertainment, a production house focusing on premium television series and feature films. Floating Island has over fourteen projects in development, including a premium television series written by Daniel Goldberg and Michael J. Wilson based on Alley Oop, the comic strip, and Dark Cloud created by science fiction writer Robert Sawyer. Jonathan has also been instructor of Media, Art and Design at Durham College. Partnering artist, Jon Riera- has a keen hunger for arts and culture from all over the world and has been able to translate those experiences into his visual storytelling. As an up and comer in the growing competitive Canadian media industry, Jon began his career handling the camera and skillfully pulling from images and experiences captured from every nook and corner of the world. Through creative directing and cinematography, Jon continues to advance his storytelling abilities and has recently been nominated for a music video award in 2014. “As proud graduates of the Metro Prep Academy we have strived to break the boundaries of artistic expression and experience through the arts and thank our first and most generous sponsor Metropolitan Preparatory Academy without whom Jon and I would not be able to have implemented this project,” said Jonathan, Co- Artist of In the Moment. This year will be the tenth edition of Scotiabank Nuit Blanc that will witness the coming together of 60 contemporary art projects by Toronto’s art community and four curated exhibitions exclusively produced by the City of Toronto. Over 45 public art projects by local, national and international artists is featured by Scotiabank Nuit Blanche under the supervision of the four curators. The participants include cultural and educational institutions, Toronto artists, museums, galleries and neighbourhoods who produce their unique projects. About 110 independent art projects will be exhibited by over 400 artists this year.